Rijiju claimed that Congress was the first to promise PRC to the non-APSTs of Lekang constituency. 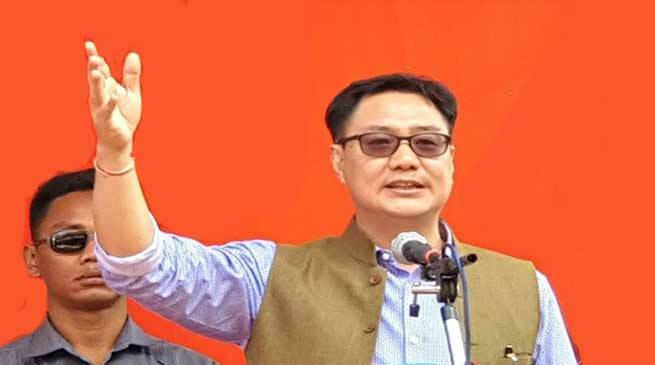 The Union Minister of State for Home, Kiren Rijiju on Wednesday while addressing a BJP election rally here alleged that the recent PRC fiasco was handiwork of opposition and that he had no role in it. Rijiju claimed that Congress was the first to promise PRC to the non-APSTs of Lekang constituency. “Last year during a Congress rally at Lekang, APCC President Takam Sanjoy along with leaders like Jarjum Ete and Bida Taku promised PRC to them. Fearing that voters may go away to Congress the state BJP leaders also panicked and went ahead with announcement of gifting PRC as new year gift which was mistake,” said Rijiju. He also added that due to politics over this issue three innocent youths lost their lives. “Takam Sanjoy who was vocal on PRC issue is now fighting election from Lekang assembly constituency.Is this not politicization of whole issue,” he added. Rijiju also stated that his two main opponents in the Lok Sabha election are being forced to contest. “Former Chief Minister Nabam Tuki is not ready to fight election but Congress is forcing him. Even he did not applied ticket and is more concern about retaining his MLA seat from Sagalee. Also just because women voters adores me, some people made Jarjum Ete to fight election thinking women voters will vote for her. But I am confident of winning as I believe I have done enough work to be considered for the second term by people of state,” the Rijiju said. He also spoke on settlement of Tibetans refugee and chakma-Hajong refugee issue during the congress regime. He said. I have never let the name and fame of state get down and will continue to serve the state and its people with renewed zeal. He highlighted the various works done by him for the Papum Pare district including sanctioning of Hollongi green field airport and Film Institute at Jote. Establishment of NDRF battalion at Hollongi, shifting of ITBP frontier HQ at Itanagar. The Doimukh assembly constituency BJP candidate Tana Hali along with Yachuli BJP Taba Tedir was also present on the occasion.